Impetus-PEF & IntoUniversity from Impetus-PEF on Vimeo. 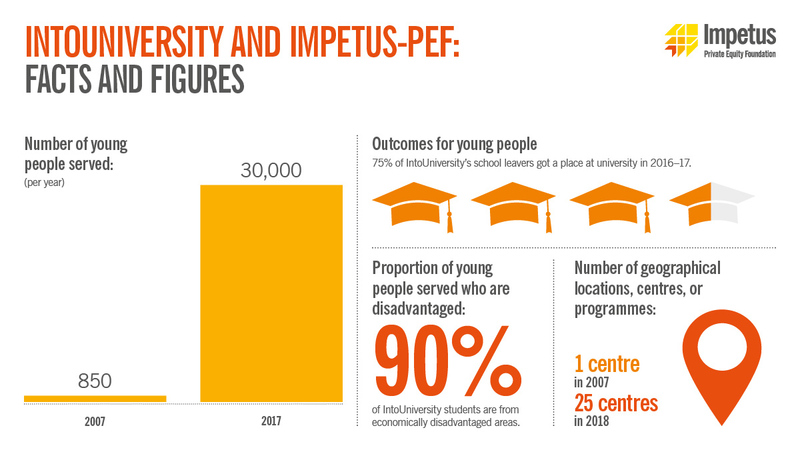 Impetus’ support has been instrumental in getting IntoUniversity to where it is today. The need: Only 24 per cent of young people from disadvantaged backgrounds go to university, compared to 41 per cent of their better-off peers. This means that 14,000 young people miss out on the opportunity each year. Our charity partner: IntoUniversity runs centres where disadvantaged young people receive support to raise their attainment and aspiration, and get the necessary information, advice and guidance to get in to university. Our impact: During our 11 year partnership, we’ve helped IntoUniversity grow from one centre in west London serving 750 young people, to a national network of 25 centres across the country, serving over 40,000 young people. In 2016, 75 per cent of IntoUniversity students got a place at university compared to 39 per cent nationally. This impact report tells the story of our 11-year partnership with IntoUniversity, totalling nearly £4 million worth of investment team hours, pro bono projects and funding. With our help, IntoUniversity are helping more and more disadvantaged young people – who are half as likely to get a university place than their peers – beat the odds. A lot of progress has been made on widening participation in higher education. But this may now be under threat. We need to maintain funding and ensure it is directed to what works – our Director of Public Affairs explains how. With the government’s review of post-18 education ongoing, and most of the debate seemingly centring on tuition fees, we must remember that widening participation work is essential to helping more disadvantaged young people access higher education. Disadvantaged young people are half as likely to university compared to their better off peers. This briefing explores how universities can help improve school attainment and widen access to university.